Writing this “From the Pews” column is the most rewarding project I have undertaken in many years. And the most exciting part of this most rewarding project is the interview process. There is something about sitting down eyeball to eyeball and agreeing to talk, and something absolutely astonishing to suggest to someone that you are interested in their story and then to hear them speak openly and freely about their life experience. 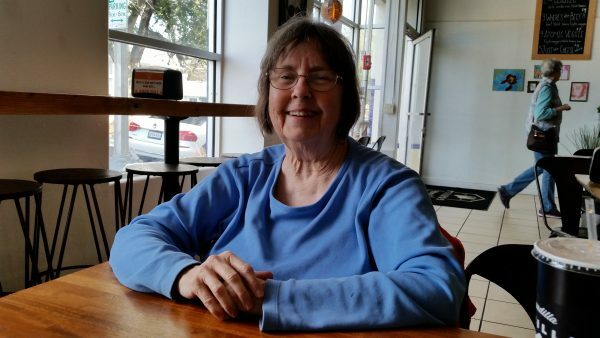 This afternoon Gayle and I met with Peggy at a popular Mexican restaurant just across the street from Fresno High School and a block or so down the street from the Big Red Church—the perfect atmosphere for an informal interview. Peggy has a great sense of humor and after we ate lunch and chatted a bit we were ready to hear her story. Born and raised in Fresno and when asked about her childhood, she replied: “I spent most of my childhood up a tree. And my best friend Rosalie was always up there with me. I wanted so badly to be a bird. My dream was to scoot out on a limb and fly far away to explore new worlds and experience the freedom of rising above the boundaries of gravity. Our neighborhood was bounded by McKinley, Fresno, Clinton, and First Streets. A working-class neighborhood there were children in abundance. My mom once counted the kids playing in our yard and declared that there were twenty-five of them running wild. It was a great place to grow up. I met Kathy in high school and we became fast friends. Today after fifty-five years we remain best buds. The fair Rosalie flew away and we lost contact. As a child I loved to dance. Mom swore that I danced before I walked. My passion became ballet and I continued to dance until I was seventeen years old. Perhaps my obsession with flying directed me toward ballet. On toe shoes the experience of ballet was as close to flying as any gravity-bound person could possibly achieve. To stretch, to soar, left me on the imaginative verge of actually being free to move into the heavens. If you remember, I reported that Peggy had a great sense of humor and it is just here in our narrative that this humor becomes evident. She told about working in an office job where she composed a soap opera spoof on life in the office called “As the Apple Rots.” Then she volunteered that some of her marital difficulties might be traced to her lack of cooking skills. “I am just not a good cook. In fact, my second husband accused me of being afflicted with what he called ‘dyscooksia.’ His notion was to send me to remedial cooking school and then sue the teacher.” It became obvious that Peggy uses humor as a coping mechanism and is an expert. I asked Peggy about her current passion and this question sparked a story that I think says it all about this interesting woman. “Dale, I went to Guatemala in 2002 with Heifer International to visit indigenous Mayan people. I have never been the same. If these people had a block house and a rusty tin roof, they were well off. If they had a cement floor, they were considered rich. For me, this was cultural shock. The abject poverty seared me beyond words. We traveled to a village in the hills where the conditions were primitive. The outhouses were down a slippery slope. It was necessary to cross a ditch and pass into a corn field to get to them. When we had to make that trek during the night, a chorus of roosters woke up the dark. I was scared to death. The man in the family I stayed with told me that as a boy he watched his parents slaughtered in front of him. I was so shaken by this whole experience in Guatemala that I hardly spoke for two weeks upon my return home. My passion is for the poor. I believe that I can satisfy that passion at Big Red Church where I receive nurture and encouragement from the beautiful worship and then find available avenues to reach out and feed the hungry.